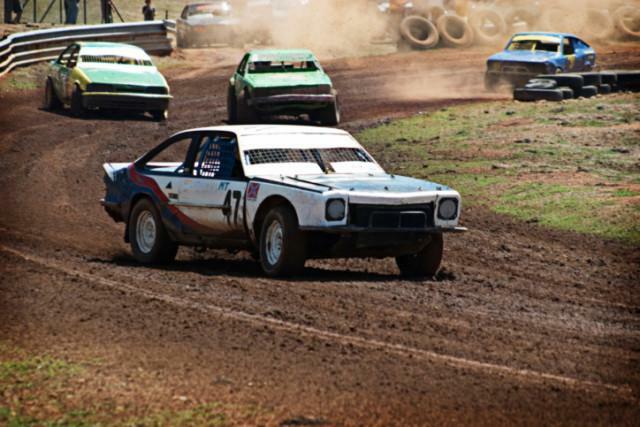 Not only is oversteer the most enjoyable way to travel through a corner, but it’s the fastest way on dirt tracks. 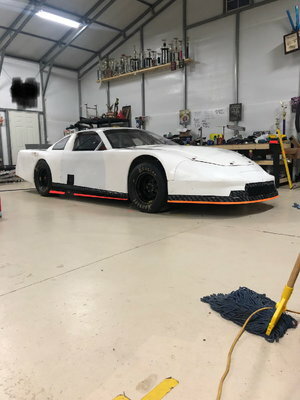 Flirting with the limit is a necessary part of racing, but the ability to determine just how flirty one gets is what makes a stellar race car driver. As most people are familiar with the idea of fishtailing, drifting, skidding, sliding, or whatever is used to refer to oversteer, it shouldn’t come as a surprise that an innate ability to control and employ a slide are skills paramount for every kind of racer. This short educational segment will delve into how oversteer occurs, what circumstances call for oversteer and how to deal with it, not just for safety, but for speed. Oversteer can be a blessing and a curse. Where it serves to aid the driver, a bit of oversteer can help pivot the car into a corner and get that all-important rotation done well before the apex, so the driver can floor the throttle sooner. Let’s begin with the areas where a bit of this willingness to rotate is helpful. On the road course, a very slight amount of oversteer is preferable in slower corners. Michael Schumacher has a very nervous setup that allows him to “chuck” the car into the corner, and a tight rear end to allow for a bit of power-oversteer when needed. This allows the man to “bend” the car at will, and watching onboard footage of the German driver, one can see how abruptly he can change the direction of his machine; never maintaining a constant angle of attack through a corner and tip-toeing on the edge on adhesion everywhere. This works exceptionally well in slow or medium-speed corners. 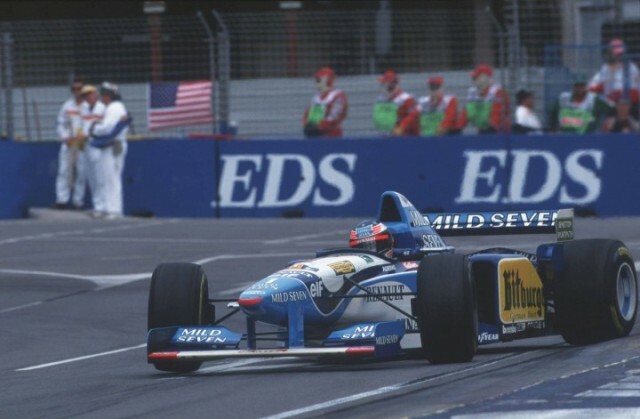 Schumacher’s extremely nervous setup allows him to pivot his car, on-command, in any part of the corner. However, in the fastest corners, oversteer not only wears the tires too quickly, but it is hard to catch and somewhat dangerous. For this reason, cars shouldn’t be harassed at high speed, but cajoled and wooed, and a little bit of understeer is the ideal setup here. The necessary, or advantageous amount of oversteer is often termed as “zero-steer.” This is when the car slides only enough to point the car at the apex, but not so far as to require lots of opposite lock. In effect, the rear slides just enough to keep the driver from having to turn into the corner. 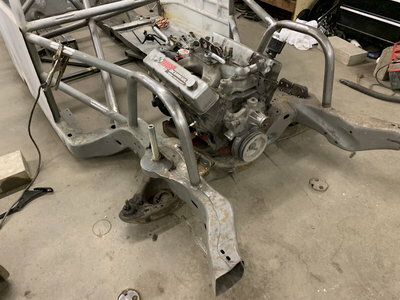 This small slide isn’t typically enough to wear the tires with much concern, and with the car straighter at the apex, the chances of a big, throttle-induced slide are lessened. When racing a car on the edge, it is usually faster to slide more at the rear than at the front. Not always true on a paved track, but on the dirt, it’s a certainty. 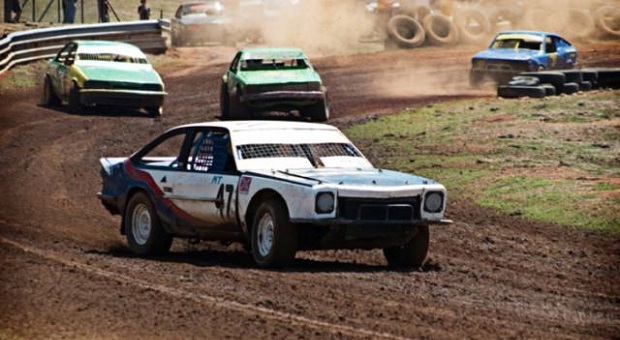 For this reason, rally cars and stock cars running on loose surfaces always have a little oversteer dialed in to help turn the car, since understeer on the dirt isn’t only slow, but it’s downright dangerous and difficult to manage. When running at triple-digit speeds through a tree-lined forest stage, the last thing a driver wants is to plow headfirst off into a nearby pine. 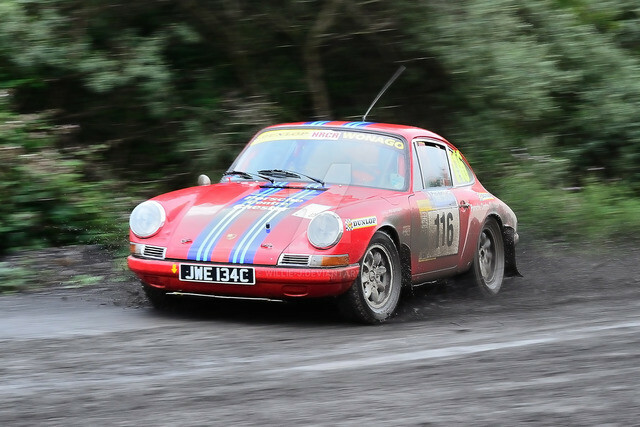 Since the roads on rally stages are typically narrow, the ability to pivot on a dime is incredibly important, even at the expense of a little rear traction. Going sideways on the rally stage isn’t just for show; it helps avoid the unforgiving trees and rocks that line the edge of the course. Basically, in low grip situations, the ability to slide at the rear allows for more consistent control of the car. 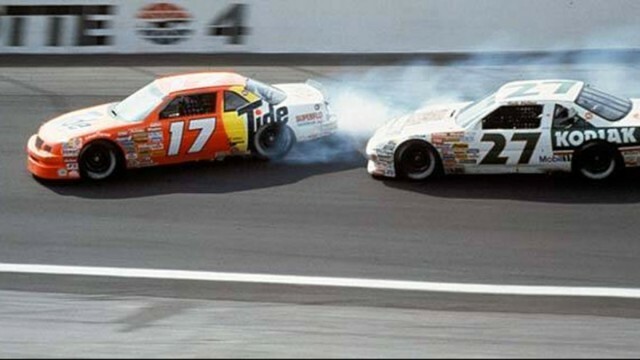 When running side-b-side on a dirt oval, a driver must make sure not to spear off into their opponent’s line, and a little bit of sliding at the rear can help pivot the car onto a tighter line. Similarly, the apt rally driver is always using the brakes to shift the weight forward on the way into a corner to help coax the rear around slightly; contersteering through the corner if necessary. In this case, a little oversteer is safer because it allows the car to follow a tighter line and the driver to improvise with the angle of attack. It is the most probably way to get through every corner on a stage: when there’s no runoff area, contingencies need to be considered. 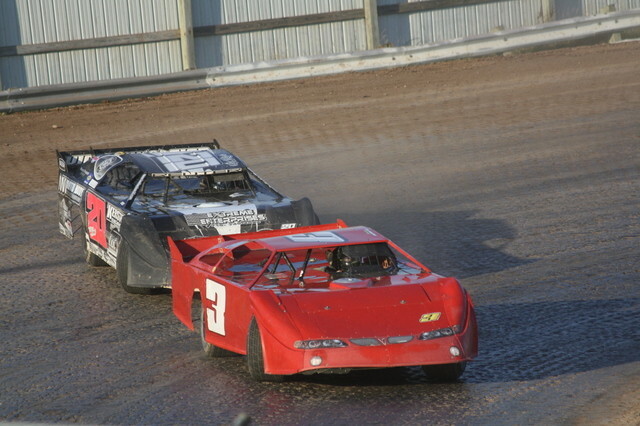 These two late models slide sideways, battling for position. The driver who can maintain momentum while taking the shortest line is the one who comes out first. Controlled oversteer allows for unconventional passes that are hard to defend against. 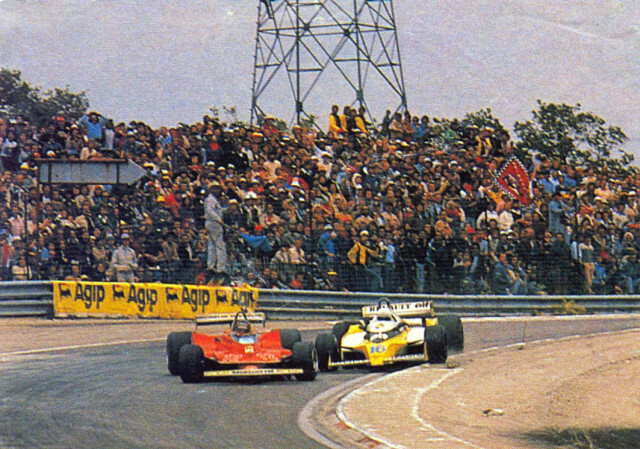 Here, Gilles Villeneuve goes sideways around the outside edge in front of Rene Arnoux. Though the driver being passed can counterattack by taking a smoother, wider line through the corner, which will often lead to a better run out of the corner, it is sometimes just enough to get in front wherever one can. Additionally, a little slide in front of, or next to, one’s adversary can scare them into lifting for a brief moment. Not only is oversteer a tactical maneuver, but it’s also a psychological weapon at one’s disposal. However, there are times when oversteer isn’t such a great trait to have – namely, on the Superspeedways and heavily banked courses. Banking is not a friend when a car snaps sideways, since the banking has the effect of spearing the car off in the direction of the front wheels too aggressively. It is for this reason that drivers are instructed not to countersteer when their car begins to slide wildly on the ovals. Instead, it’s safer not to wrestle with the wheel and let the car spin low towards the base of the banking. It’s for this reason that it’s so important to get the suspension settings right in an Indycar, say, which is less forgiving since it is mid-engined and aero-dependent. Having too much oversteer here – and very little is already too much – will only lead to a crash throughout the course of a race. 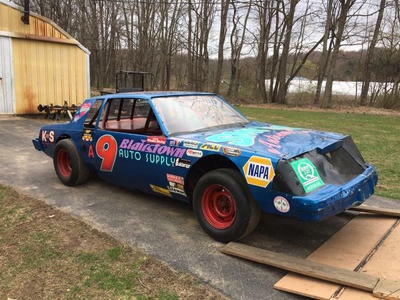 With a stock car, the flex, lack of downforce and weight distribution allows for a little more oversteer, but even still, when one is run too “loose,” the chances for a big spin goes up considerably. This amount of oversteer is hard to wrangle with a stock car, but it can be controlled. Controlling oversteer is one of the most enjoyable parts of driving, and occasionally, it can be used to one’s advantage. Not only will control over an unruly rear end serve as an advantage in looser surfaces, but if a driver is skilled enough to pitch a car sideways to a corner, they have the ability to deal better with slick surfaces, assert dominance and sneak inside a corner when a competitor thought it impossible. Not only is the ability to harness oversteer practical, but it can intimidate an opponent who is slightly petrified every time a set of spinning rear tires edges past their flank, hurling bits of rubber at them like a fleeting squid spitting ink.